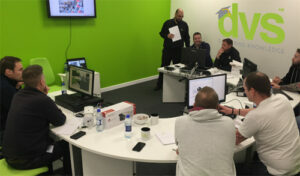 DVS has opened its Delivering Knowledge Training, reportedly the only accredited company to offer HCSA (Hikvision Certification Security Academy) certification outside of Hikvision. The recently established academy offers hands-on training, tailored for security professionals. The full-day courses are free and guarantee attendees a thorough and holistic understanding of installing and maintaining the technology. Designed with the collective knowledge of the DVS and Hikvision technical teams, the academy encompasses all aspects of the security installers needs. Limited to eight people per session, the day is structured to offer a bespoke learning experience to maximise the understanding of the participant. With topics such as IP, Turbo HD, 4K and ANPR being covered, graduates are left with a broad understanding of current security equipment and how it is best utilised.